Villa UJV 148, also referred to as Villa Belle Bague, is a luxurious 4-bedroom villa located high on a hillside in Colombier, St Barts. 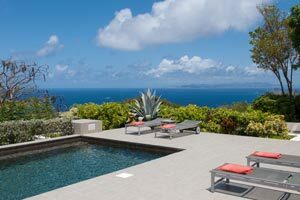 It offers 270º views over the ocean from Anguilla to St. Kitts. The property is sunny and enjoys spectacular sunset views. Three of the four bedrooms are in separate cottages located around a cloister with a stone fountain. Each is furnished with traditional colonial-style furniture augmented by exquisite upholstery and window treatments. They have a private terrace furnished for sunbathing, a bathroom with a granite-topped vanity, and every technological amenity a guest could want. The fourth bedroom is similarly furnished, facing the pool terrace. The common areas areas consist of a large living room with walls of French doors; a dining room complete with a French sideboard and an antique Anglo-Indian chandelier; a breakfast terrace with an adjacent area for enjoying morning coffee; a professionally-equipped granite and stainless steel kitchen, a fully-equipped gym; a cocktail terrace with a bar, and terraces and decks serving a 40' heated pool with a granite-faced waterfall. 5-10 minute drive to Flamands.